Ok, back to an HDR shot. I do like to experiment with photography and try new things. My last two posts were a macro and a Black & White, but after a couple of days of not posting an HDR shot I start to get itchy. I really do love HDR and find it fun and fascinating. 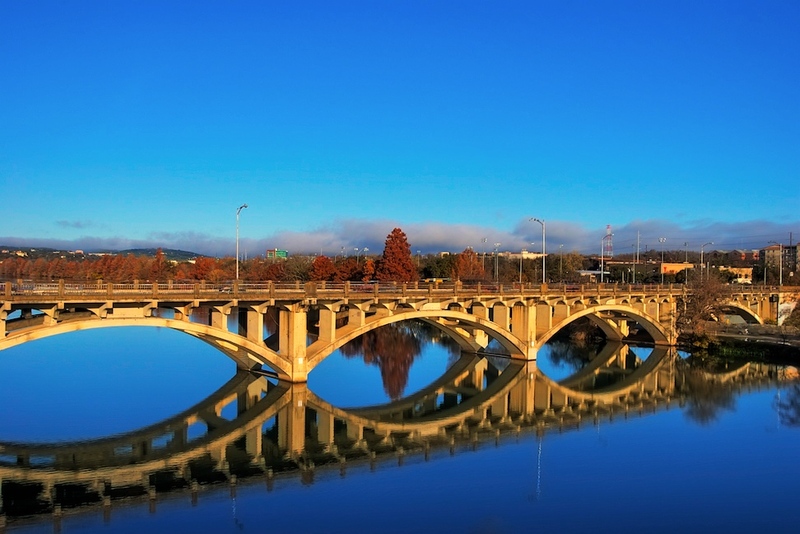 This is the Lamar Street bridge in downtown Austin. I have taken many shots of this bridge, from many angles. They always come out great in my opinion. The bridge is very photogenic. Most folks in Austin shoot the Pennybacker Bridge (aka Loop 360 Bridge) and it is certainly an iconic symbol of Austin, not to mention a great looking bridge. But for some reason, I keep getting drawn to this bridge more often than the Loop 360 bridge. This one is much smaller, and much simpler, and I guess I like that about it. I really like the graceful symmetry and the consistent pattern of the arches. On the morning that I took this shot, the weather was fabulous and the skies were mostly clear. A bit earlier there were a bunch of clouds passing through, and you can see them in the distance, but they never materialized over the bridge - that would make an excellent shot. This is a 5 exposure HDR taken at f/13,with exposures from+2 to -2. They were merged into an HDR in Photomatix and then I made additional adjustments in PSE (Curves, Contrast). I made final adjustments in Aperture and there you have it!